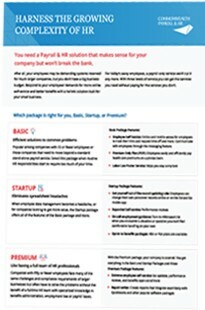 The Basic package is popular among companies with 15 or fewer employees. 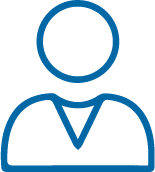 It’s ideal for companies that need to move beyond a standard stand-alone payroll service toward efficient solutions to common problems. When routine HR responsibilities like absence tracking, time-off requests, and timesheets are starting to require too much of your time, online and mobile self-service options provide employees valued independence and flexibility to track their time and request time off. You can communicate with employees through the employee self-service system’s messaging and portal features. Employees will appreciate the extra dollars in their pocket that come from the Premium Only Plan (POP) which allows employees to easily and efficiently pay health care premiums on a pre-tax basis. Plus, you’ll stay compliant with the turnkey labor law poster service. Employee Self Service: online and mobile access for employees to track their time and request time off and more. Communicate with employees through the messaging feature.